Synopsis: Residents Martin Lee & Chetan Mistry noticed the high number of children walking to and from school in the Tahoe/Colonial community of southeast Sacramento. They also noticed many of them making common and potentially costly safety mistakes. 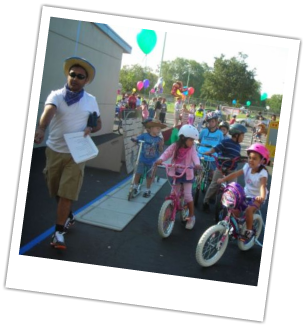 So the young doctors worked with their Community Faculty Heather Hutcheson, a neighbor and advocate in the community, to put on the community's first-ever "Urban Cowgirls' & Boys' Bike Rodeo" in the fall of 2007. Chetan, Martin and Heather were also able to pull in the UC Davis Injury Prevention Program, which supplied a "safety city," script, bicycle helmets and educational materials at the event. The residents also worked with Heather to involve the local REI store, Kaiser Permanente and other sponsors. With more than 200 children and families in attendance at the first event, the community recognized its importance and has vowed to make it an annual tradition!